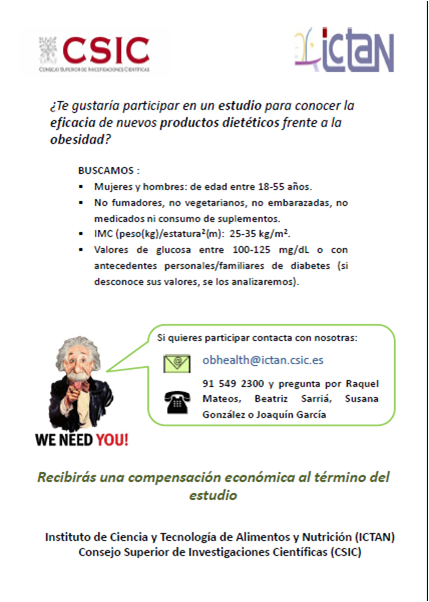 We are looking for volunteers to participate in a study performed by a research team from the Department of Metabolism and Nutrition at ICTAN (CSIC). The clinical trial aims at evaluating the efficiency of new natural products combining antioxidants and dietary fiber as dietary tools against obesity/overweight and associated pathologies (hyperglycemia and dyslipidemia). Inclusion criteria: women and men 18-55 years old; BMI > 25-35 kg/m2, not following any medical treatment. Fasting glucose concentration: 100-125 mg/dL or having family/personal background of diabetes (if you do not know, we will analysis your glucose levels). Exclusion criteria: suffering from other acute or chronic diseases. Taking drugs, hormones or dietary supplements. Being vegetarian or smoker. Background of hypersensitivity or allergy to any of the components of the food products studied. Pregnant women. Following a diet or physical training to lose weight. You will receive an economic compensation at the end of the study.